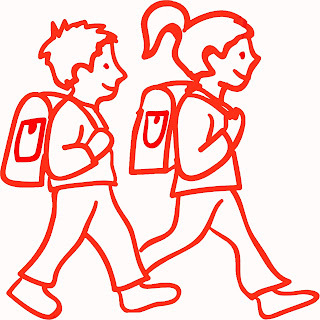 October 5th is International Walk to School Day! Glendale elementary and middle schools will be joining schools from around the world to celebrate. Millions of kids worldwide will be walking to school and approximately 10,000 students from Glendale alone will walk to school along with parents, teachers and community leaders to demonstrate the benefits of safely walking to and from school. Kids love to feel self-sufficient and learning their route to and from school is a great way to instill a sense of confidence and independence. It’s also a great opportunity to teach your children valuable safety lessons they will use for many years to come. We all know that exercise is good for our health but did you know that physical activity before class helps kids be focuses and ready to learn? More kids walking to school translates into fewer cars on the roads around schools. Reducing traffic around schools results in improved quality of air that children breath in and around their schools. Join us on October 5th and share your walk to school on social media using #GlendaleWalks. Show us how you practice safe behavior or share some of the beautiful sights along your route, but remember, safety comes first so don’t be a distracted walker!